Lyle: You're going to learn how to jam along to this jam track. For the first rhythm riff I suggest you use a basic clean setting if you're using an electric guitar. You could use a just a little overdrive, hardly noticeable if you know what I mean. Try using a single coil pick-up with little or no effects. Lyle: As you can see in the chord chart above, this is another basic 12 bar blues progression in G so your three chords will be G, C, and D. Instead of using those 3 basic major chords you'll use dominant chords, which will give you a bluesy sound than if you were to use just plain major chords. Lyle: Remember that dominant chords are built from major triads, 1 - 3 - 5 degrees of the major scale and then a b7 added to the triad. The "9" chord is (1 - 3 - 5) - b7 - 9. Lyle: This rhythm riff uses all up strokes, on the "up beat". Lyle: This rhythm riff uses a type of chord muting that helps give you that tight rhythm accent for each up beat in the measure. 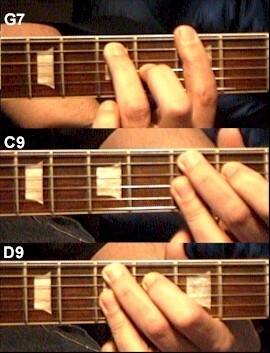 Right after you hit the chord your left hand releases pressure just slightly of the strings to stop the chord from ringing, at the same time your right hand dampens the strings down by the bridge to aid in muting. (see video) It will take some practice if this is new to you. Here's a close-up video clip that shows how both hands help with muting each strum right after you hit it. Lyle: I can hear you jammin from here! Lyle: Learn the rhythm riff and play along to the Jam Track. Lyle: Let's move to another rhythm riff you can play over this progression. Here's the main riff to learn first. Use a slight palm mute effect by touching the heal of your right hand on the bass strings back on top of the bridge saddles. Notice that the strings should sound a little muffled. Lyle: I choose to stay on the 6th string bass note for the C and D chords to remain consistent with the over-all tone of each chord. Fatter strings make for fatter tone, so by keeping the C and D chord based off the 6th string, you'll get the fattest sound tone from each chord compared to playing it anywhere else. It is a little tricky moving your wrist that fast to get from G to the C or D chord and it's ok of you hear a little bit of slide between chords. Lyle: You can use this new alternate version for the C and D chord. This groove seems to give a little extra swing to the sound. Sometimes you want that, sometimes you don't. Try mixing the two patterns together. ToneDeafVagrant: Nice, It's the same scale pattern, just shifted up the neck for the min pentatonic? Lyle: Next lesson you'll do this jam in the key of E.
ToneDeafVagrant: Min pentatonic over the one sounds sort of muddy due to the b3? - major sounds much better over the 1. Lyle: Look at this TAB, you'll see the G7 chord and the G major pentatonic share the B natural note, which is not in the minor pentatonic. Lyle: Let's take a break here. In the next lesson you'll be able to take what you've learned here and transpose it to the a Blues Shuffle in E.